In this series, I respond directly to comments left on my YouTube videos. This is the first Comment Response to be produced and released specifically as a podcast and the plan is for all future installments of the Comment Response series to be released in this fashion. 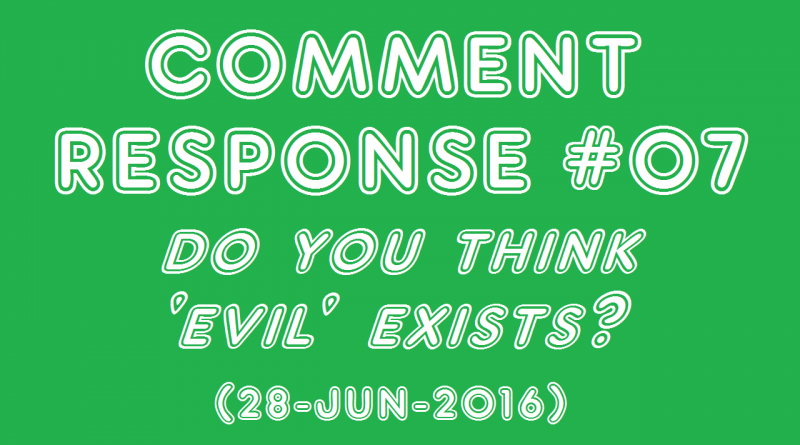 Episode #07 is focused on the comments section of ‘JLB1666 | Do You Think ‘Evil’ Exists?’. Good work on the new format mate. The only negative is the audio volume could be a bit higher. I thought that also but there’s a wee volume button just at the side of the audio file, I didn’t notice it until 5 minutes in. Thanks for the feedback, JBS. I am now using podbean so the media player should be easier to work with. Best of luck with your new website . Thanks, Del. 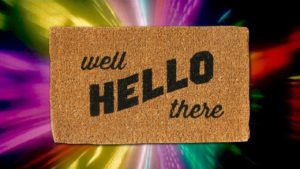 I hope you will be a regular contributor here. Your experience in this scene will be invaluable for newer people who stumble across this website. Excellent new web page mate, you are truly dedicated to the cause, thanks for mentioning my YouTube channel, its a privilege to be part of this. I listen to quite a lot of podcasts also so this will be very handy whilst I’m working etc. All good, Ged. I’m hoping this site will serve as a hub for any skeptics in this scene who can see what is going on – beyond the facades of the YouTube personalities and their ‘movements’. The real question is what is existence and its purpose? And why is the search for balance or “grace” in all things so important in acquiring the hues necessary to become hue-man. “Evil” being the reverse of “Live” is just a symbolic representation of that which is anti-life or has not yet been properly yanged in the Yin-Yang for its current aspects of “vice” or hurtful and anti-life elements to acquire an extra “v” and transform into a graceful and balanced “wise” in wisdom. Hence why we seek the add-vice of the vvise (people with more experience in the task of neutralizing “evil” by knowing the exact degree of any particular “vice” to engage in in order to achieve a more overall balanced “virtuous” (vert = green in French; verite = truthful in French) existence. It’s all about balancing elements in what is called a synergetic or synergistic fashion where wholes become greater than the sum of the individual parts and 2+2 = more than 4, the act of creation already emerging from properly harmonized action as well as individual genius nurtured in the context it thrives most in. Excellent comment and questions. I found your Chronicles (#11, I think) very useful in this regard. ‘Any sane man’ etc. I think I have in my possession sound enough reasons for my belief in my current mission, but did I find the reasons for the mission or the mission for the reasons? Humans seem to have an uncanny ability to rationalise any position we have already taken (or been given). Hopefully you stick around and keep these kinds of questions coming. Also I hope we can hold an Impromptu Chat some time. I’m my own boss and whip-cracker John, so you name the time and place for the “Impromptu chat,” no more than 24 hours notice required in most cases so I can clear a block of time, and I’ll be there. https://archive.org/details/NegentropicChronicles11. the above link doesn’t seem to post because there are two dots before the mp3 in the URL. Should have known that before I left the period in at the end of the file name. lol Just go directly to that page and click on the the player on top of the page or the mp3 link at download options. Correction : Replace (people, including the parenthesis in front with ,those (comma followed by “those”): Hence why we seek the add-vice of the vvise, those with more experience in the task of neutralizing “evil” by knowing the exact degree of any particular “vice” to engage in in order to achieve a more . . . etc. In other words, there is vice which is due to mistakes being made in the search for happiness and peace-of-mind and there is vice which is deliberately engaged in and promoted in order to prevent others from achieving that balance in their lives. Therefore the deliberate engager of chaos or entropy become the anti-live or “evil” being. Well said, I agree with that. I love the philosophic approach you take when responding to your comments… i was reminded of the first two verses (versus) of a Pete Seeger song, Beautiful Loser: He wants to dream like a young man, with the wisdom of an old man. He wants his home and security, he wants to live like a sailor at sea. Well, who doesn’t? But to live it… that’s different. It was never meant to be this difficult… i know that because i come from a time, not too distant, when it was not this difficult. May the wind be always at your back. Thanks, Wanda. Sometimes things seem difficult, other times I look at how much opportunity we all have right now and wonder why more are not doing more. It is ALL ahead of us. So much power at our fingertips, and other minds out there waiting (some searching) for a better understanding; an understanding which anybody who visits this site probably has some confidence they have already found for themselves. Thanks, Nathan. I’m surprised you haven’t already updated your avatar. I was wondering what this highly recommended podcast was and aha it is Jeanice Barcelo. I caught her on the “Higher Side Chats” podcast a while back which was a fantastic interview and certainly changed my perspective on hospitals, the process of birth and all the rest of it. There’s no way I would let anyone I care about have their baby in a hospital now. Jeanice’s interview on Renegade (the one I promote in this CR) changed my life. It is that simple. I’m glad to hear she had a positive effect on you, too. How have your views about hospitals gone down with family members? The programming about medicine runs DEEP (see Clooney on ER for a classic example). Well I was home-birthed, and my mum was always anti-vaccination so I never had any of those – so I would say that I have moved closer to her point of view on these things, which is nice. It’s friends my own age who are potentially having kids soonish that I don’t think I will have much luck getting through to. Most people think you’re evil and irresponsible if you don’t get your kids vaccinated and they trust the medical establishment completely. If you talk against it they get very emotional. You are quite right that the programmed masses tend to get emotional when you dare question doctors/television/etc. It is like a Pavlovian response. I sometimes find it useful, once a person goes into their trained emotional response, to ask them why they are getting emotional about the topic. Generally the lower intelligence people will immediately defend it along the lines of ‘well this is an important topic!’ (which obviously does not answer the question) but I have also seen people take a deep breath and calm down, at which point rational discussion may begin/recommence. To have the concept of “evil” or “bad” requires to have the notion of “divine” or “good”. They are mutually dependent. Those concepts would not make any sense without the unconscious comparison to their respective opposites. In this sense what they designate does not “truly exist”. Also – as “absolutes” those concepts require the “religious” belief in (or the unconscious comparison to) their overriding “absolutes” – namely, a “satan” and a “god”. The prevalence of all those concepts in the Western culture stems from the monotheism Christianity and Judaism which have “shaped” the Western mentality (plus today increasingly Islam, too). Those concepts with their “belief fathers” are altogether illusory – part of an old “religious” program of conditioning the mind “away” from the reality of the universal dependent arising. Furthermore, they are used by the psychopaths in power to make the ordinary person follow their basic manipulation of “evil comes from others” – as the hideout for their true agenda. On the level of the conventional, everyday reality concepts and notions have to be used. But these should be relative notions – not those absolutes rooted in the monotheisms. An example is the Early Buddhist “atheistic” pair of “wholesome” and “unwholesome” – which highlights the conditioned nature of everything, as rooted in our very intentions.